Retweet.com For Sale. Buy It And Risk A Lawsuit From Twitter. Last summer, we wrote about the launch of Retweet.com, a Tweetmeme knock-off with a killer name. Mesiab Labs, a company associated with some spammy Twitter projects like Hummingbird, launched it in August with some fanfare. However, since then, Tweetmeme has remained the king of the space. And now Mesiab Labs has put the killer domain up for auction. 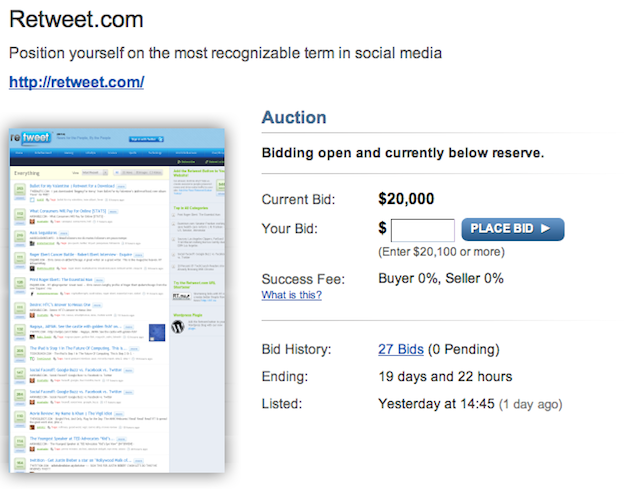 As you can see on this Flippa page, the current bids for Retweet.com stand at $20,000. This is a huge increase from yesterday when the bids hovered around $10. So far, there are 27 bids. The listing on the site claims the domain gets 12 million uniques a month, and 26 million pageviews. If that’s the case, you have to wonder, why sell? Well part of the reason has to be that Twitter itself is trying to trademark the word “retweet.” Mesiab Labs was also apparently tried to trademark the name, though it’s not clear if that failed or if they are simply moving to sell before that happens. Twitter also tried unsuccessfully to trademark “tweet” last year. There are some truly remarkable things about the term ReTweet. First, as we all know it was created by the users of Twitter – NOT by the Twitter itself. Second, like “Googling” something has become synonymous with using a search engine, “Retweet’ing” has become synonymous with the act of spreading online content virally. While we aren’t the only ones in this space, we feel privileged to participate. Now that we’ve grown and scaled the Retweet network and infrastructure, we’re ready to pass it on to someone who can truly push it to the next level. We’re excited about the opportunity for a new passionate owner to foster and grow Retweet.com and continue to tap the potential of what is undeniably becoming a monumental shift in news consumption. They go on to note that if they don’t find a suitable buyer in 30 days, they’ll continue to operate the site themselves. It is a pretty killer domain, but is it worth the risk if Twitter gets the trademark?